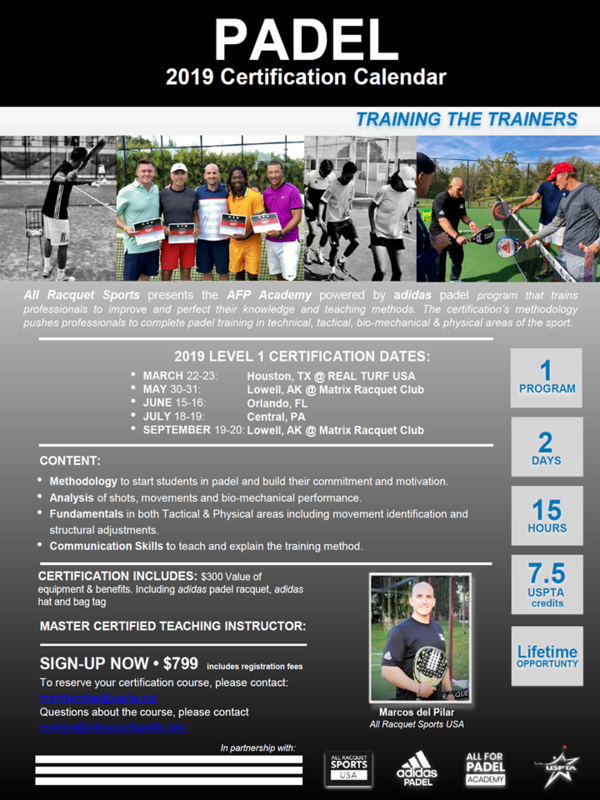 My job as Certified Padel Teaching Professional for the USPTA Padel courses is a very important part in the hard way of spreading the sport of padel in the US. 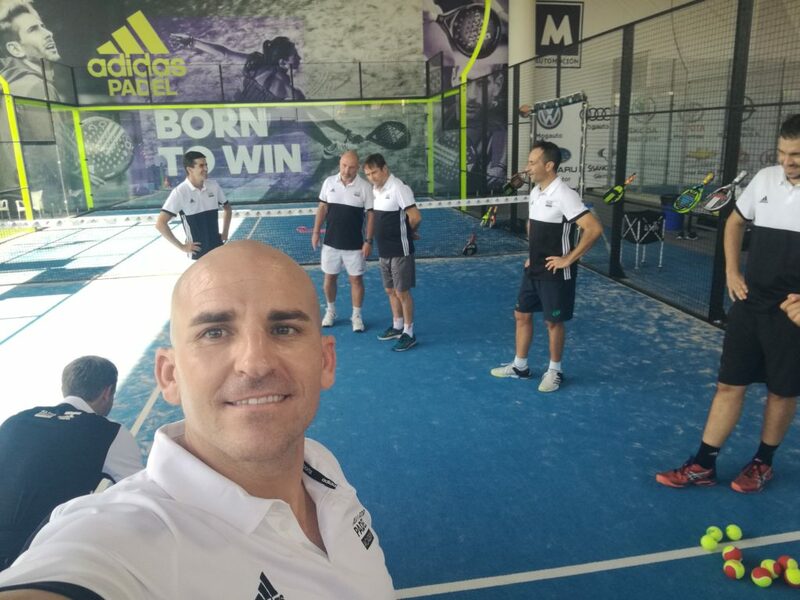 With all the crew from ADIDAS PADEL in Spain and ALL RACQUET SPORTS here, we are performing a tireless work in the development of the sport in all its areas. That´s what we call our 360 º Padel proposal (court building, training the trainers and product retailing solutions). Passion is one of the most important leverage when working with people. It can be felt around. Not everybody knows how to transmit and connect with students but, as almost everthing in life, it has to be trained. If you love the sport, you´re only half way far. I am genuinely proud of being part of the AFP Academy powered by adidas. The project is super exciting and allows me to develop in the teaching area that I like so much since 20 years ago. I love teaching and I always enjoy when getting into the Padel court with my players. We are trying to create an industry in North America and it is very important to give the tcoaches the guidelines and the right tools to spread the concepts of Padel out properly. The Certification course that we provide is tremendously complete and we leverage on the technical and practical area in a very intense way. The coaches have also access to an online platform where they can consult all the contets explained during the course and they can use that audiovisual resource as a tool for consultation and development. Education is one of the fundamental pillars of the development of the sport in emerging countries and is one of the bases of the exponential growth of sport in a sustainable way. Good coaches generate successful students and the more happy and learning players there are, the more organic the growth of the sport will be. more than 12,000 tennis coaches in the country that need an easy transition from tennis to Padel. We want to help them all. Part of our strong partnerships in the country is the United States Professional Tennis Association (USPTA). It is the institution that joins and regulates all the racquet sports coaches in the United States and we work very hard with them to maintain the educational standards and to guarantee the growth, development and health of the sport in the long term. It is a big pride that the AFP Academy powered by adidas join forces with ALL RACQUET SPORTS and the USPTA in this exciting adventure of building an industry in the country of opportunities. Every part of the team have been working very hard for many months. I am sure that very soon we will see the results and we will continue creating an environment full of opportunities for all. Our friends from USPTA made this video for us to promote and explain very quickly WAHT PADEL IS. You cannot miss it. It´s worth it. I promise. 60 seconds video understand what Padel is and to feel the passion! Hope you enjoy the blog. I love what I do. See you guys soon at the Padel courts!